My mind is still reeling from the sheer brilliance of what I saw on stage. Under the creative flair of director Lara Bye, this is one of those productions that slams home just why Shakespeare still rocks audiences 400 years after his death. Based on historical events of 15th century England, Richard III tells the story of power struggles between two families, the House of York and the House of Lancaster. After a blood-soaked war the House of York stands victorious and Edward IV (Nicky Rebelo) reigns as king. All seems well, but lurking in the dark corners Edward’s psychopathic brother Richard (Warrick Grier) is plotting to overthrow the kingdom and take the crown for himself. Deformed, miserable and just plain evil, Richard goes about like a steamroller of destruction, systematically ordering the deaths of every man who might stand in the way of his ascension to the throne, including his own brothers. With his snake-like tongue he seduces Lady Anne (Kate Liquorish) whose husband and father he has just murdered, only to later remove her from the equation as well. Richard is ruthless, corrupt to the core, malevolent. He’s the perfect character you love to hate. Lara Bye shows a keen eye for the multi-layered plot and intricate dialogue, wringing the most out of every pun and ensuring the clever wordplay comes fast and furious. At first, some witticisms went over my head as my brain adjusted to the Elizabethan English, but once I adapted to the lingo it all flowed in brilliance. Replete with murders and backstabs, the feuds between family members are fought with insults as sharp as drawn swords and curses that wreak the slow destruction of poison. Rooting for revenge, it is most satisfying to watch the curses placed upon Richard III come to fruition as the scenes progress. This production has many strengths, but the finest is its cast. Richard III is heavily carried by the eponymous character, and without an extremely strong actor to play the title role, the core of the play would collapse. Warrick Grier’s interpretation is a masterclass. The rest of the cast is a great match for this extraordinary lead, and between just 14 actors they cover 52 different characters with extraordinary fervour. Aided by stylized props, costumes and lighting, the design falls somewhere between future steam punk and classic medieval. At times it felt like watching a live production of Game of Thrones, only with less blood and snappier lines. The fact that the play is performed in the open air also brings a magical element to it: the live fire, the wind blowing through the Queen’s hair as she curses her son, the leaves falling from the trees as the death of the king is announced. This is a production of epic proportions, yet familiar. Director Lara Bye compares the protagonist’s ruthless climb to the top to the business practices of our modern corporate world, saying: “The greatest tragedy of all is that so little has changed since Shakespeare wrote the play.” Richard III’s moral wasteland holds up a mirror to our current political system – the greed, the corruption, the blatant lies, manipulation of the citizens, exploitation of the weak and the disturbing presence of holier-than-thou religious figures in the most deceitful of conspiracies. That Shakespeare guy, he got it: art imitating life imitating art. The year is but young but The Tragedy of King Richard III is one of the best productions I have seen to date. Go see Shakespeare like he intended his shows to be seen – under the open sky. Head to Maynardville Open Air Theatre a bit early, have a picnic by the pond and then take your seat to be enthralled, entertained, shocked and satisfied. Be part of the magic of this unique event that puts Cape Town in a special place on the world theatre map. 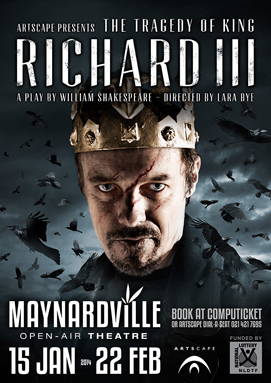 The Tragedy of King Richard runs at Maynardville Open Air Theatre 15 January – 22 February 2014.